Rest Breaks Hearings Next Week! The 2019 Legislative session officially began Monday with the swearing in of new legislators. Notably, this biennium, we have the most pro-nurse legislature in recent years! Your public affairs team has been hard at work this week meeting with legislators and coordinating with partners. WSNA testified in House and Senate hearings on the Governor’s budget this week – speaking to the importance of new funding for school nurses, nursing education and public health. Looking ahead to next week, both the House and Senate will hold hearings on our Rest Breaks bill on Monday (more on that below). On Monday, January 21, both the Senate and House will hold hearings on the Rest Breaks bill. The Senate Labor and Commerce Committee hearing will be held at 10 a.m., followed by the House Labor and Workplace Standards Committee at 1:30 p.m.
Because it is a new biennium, these bills have new bill numbers: SB 5190 (Senate) and HB 1155 (House). We are optimistic that both bills will pass out of these committees, but we need your help. We know that when nurses speak, lawmakers listen! 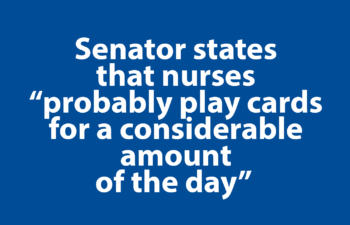 Click here to tell your legislators to support rest breaks for nurses. This year WSNA’s Advocacy Camp is the designated activity for schools and students, with a revamped structure to facilitate learning. Enjoy a morning keynote from Lieutenant Governor Cyrus Habib, a buffet-style hot lunch and discussion with a panel of legislators. With the change in venue, we are pleased to offer a flat rate registration fee of $25 for all participants – and parking is free. For more information and registration links, click here. The goal of WSNA’s Lobby Day is to advance our legislative priorities that support nurses and patient safety. This event will include a morning briefing session to help participants get up-to-speed on key issues before the legislature. A few legislators will be invited to speak at this event and WSNA’s Legislative & Health Policy Council will present the Association’s 2019 Legislative Priorities. Time will also be spent role-playing to prepare for afternoon appointments with your legislators. After lunch, you will head up to the hill to attend meetings with your legislators. This is a great opportunity for nurses to talk with their lawmakers about key issues, such as the need for uninterrupted rest breaks, as well as funding for school nurses, nursing education faculty, and public health. As news about our legislative priorities develop, watch for Action Alerts from WSNA regarding when to weigh in. 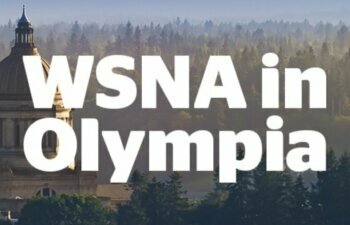 Of course, one of the best opportunities to take action is by joining your fellow nurses in Olympia for WSNA Lobby Day and meet with your legislators face-to-face! Please look for regular email updates on legislative action as the legislative session gets underway – we look forward to your participation in the process!